ZTE began its second phase of life – the “after” phase – over the weekend after receiving final clearance from the U.S. Department of Commerce’s Bureau of Industry & Security (BIS) officially removing ZTE from the “Denied Persons List.” The resolution brings to an end a three-month shutdown since the BIS imposed sanctions on ZTE in April for not complying with terms of a settlement reached with the BIS in March 2017. Now the hard work starts. Supply chains need to be put back together. Production lines need to be brought back online. And most importantly, customer relationships need to be reestablished and reaffirmed. Ultimately, that may be the biggest challenge in an environment where CSPs have many vendors and solutions to choose from. For wireless operators, this is a particularly crucial time as they begin to get serious about 5G. To its credit, ZTE, prior to the shutdown, had devoted significant R&D and technology leadership to 5G. It must now demonstrate clearly that its 5G portfolio and vision continues to evolve at the same pace it had been prior to April. The “trust” issue is further complicated by the possibility of the U.S. re-imposing sanctions. In the short term, the U.S. Congress could choose to impose sanctions during the reconciliation of the defense budget, due to occur in the next few weeks. In the long term, the BIS can re-impose the export ban at any time during a ten-year probation period if it believes ZTE is not complying with the settlement agreement. 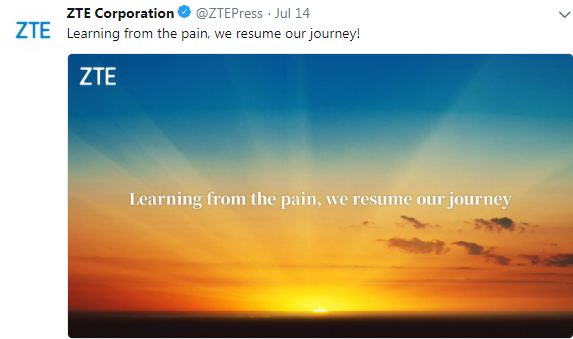 Some operators – including those in its important home market of China – will no doubt be eager to embrace ZTE again and will resume business as usual with ZTE as soon as possible. For international vendors, it will likely take some time for them to be convinced that the “new” ZTE has “learned from the pain.” Luckily for ZTE, the road to 5G will be a multi-year journey, meaning the company has time to reestablish the 5G momentum it had been gaining prior to the shutdown.